It can be uncomfortable for students to reject pressure from friends (or from within) to do something they don’t want to do. Ask students to share examples about when they might have found themselves in uncomfortable situations, and how they managed to get out of them. Then, share the digital activity link below with your students. 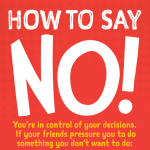 Review the suggestions for saying “no” to tobacco, and display the poster that provides refusal tips while doing this activity. You’ll find the poster link in the “Materials” section. Have students work in groups for the “Act It Out!” exercise. Select some groups to act out the scenarios for the class. Ask the rest of the class which refusal techniques might work best. Discuss the possible consequences that might ensue from the different techniques. In discussion, get students to talk about which refusal techniques work better than others. Explain that in order to choose the best technique for them, they need to feel comfortable with it. They also need to consider whom they are refusing and how that person will receive the refusal. (Is this someone who responds well to humor? to confrontation? to politeness?) Get students to talk about the usefulness of practicing these sorts of strategies ahead of time so they are comfortable using them.